Zero cost services to help employers manage and promote Payroll Giving. Whether or not your company is registered for Payroll Giving, we can help you increase engagement and reward from your scheme. Payroll Giving can be included with most Flexible Benefits packages, although the admin side can be tricky. We've got vast experience with clients such as Morrisons, in integrating Payroll Giving into benefits platforms. 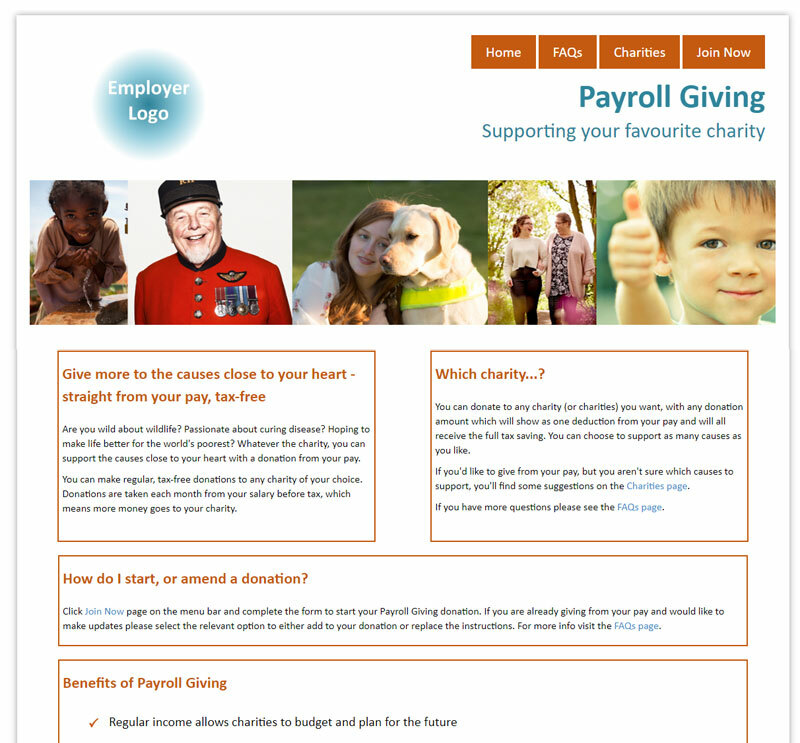 We provide free bespoke web pages for employers to promote Payroll Giving. These can include log in functions and link to Flexible Benefits packages. Microsite: this can be modified with specific pages as required, with all pictures and text editable. One page interactive: this is a one-page simple design that is fully mobile responsive to display well on all devices. The pictures and text can also be edited as required. 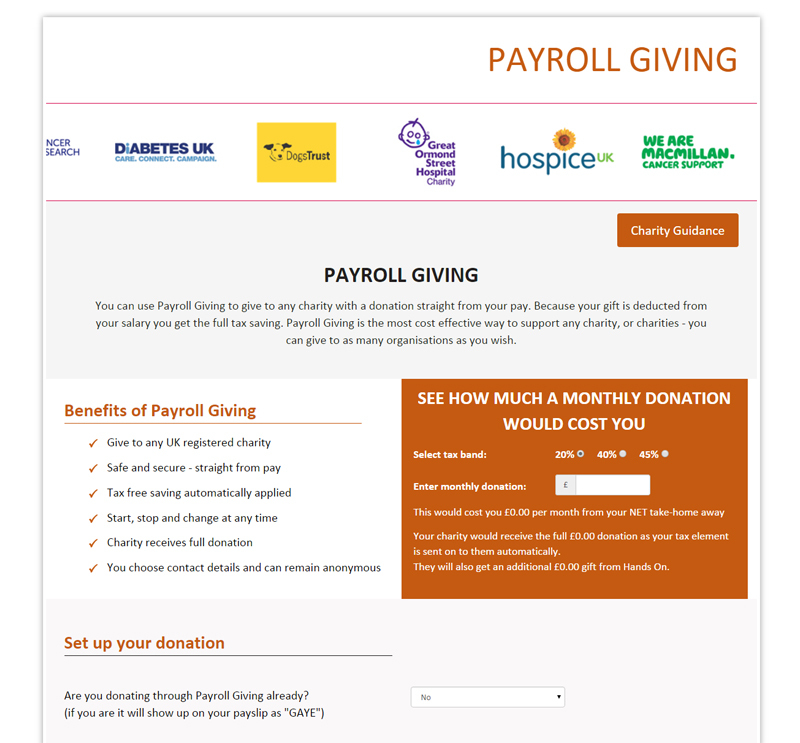 Payroll Giving is completely free to operate. However, some employers opt to cover the administration fee that is charged by the Payroll Giving Agency - this is about 25p per month, per participant. If an employer covers this it means employees’ full donations reach their nominated charities, otherwise it is deducted by the agency from donations. Every Payroll Giving Agency is a charity in its own right and is regulated by HMRC. Hands On Payroll Giving does not receive any part of donations. The below can be used to calculate how much monthly administration charges may be varying participation levels and average donation amounts. If you covered the admin fee this would cost approximately: per month (payable to your contracted Payroll Giving Agency). For help with understanding admin fees please contact us.